Stationer, bookseller and newsagent, West Street, Midhurst. Thomas Maides was born in Stedham in 1837 or 1838. In 1862 he married Fanny Wells, who was about his age and came from Duncton. The couple had their first child, Thomas Maides Junior, in 1863 while still living at Stedham. About a year later they moved to Midhurst, where Thomas founded his stationer's business, which seems to have quickly prospered. At least 7 more children were born: William in 1865, Albert in 1867, Arthur in 1868, Emily Matilda in 1871, Fanny Kate in 1873, Mathias in 1875, and Jane towards the end of 1877, at which point Fanny died, presumably as a result of complications following Jane's birth. After leaving school, Thomas Maides Junior began helping his widowed father run the West Street shop. In 1894 he married Myra Hammond (born 1866) and the couple moved to a house in Wool Lane. The 1901 census records that he already had a two-year-old son, Frank W. Maides. When his father died in 1911, he took charge of the West Street shop. Possibly he went off to fight in the war because the business is listed in Kelly's 1915 Sussex Directory under the name "Mrs Thomas Maides". In the 1920s it was known as Thomas Maides & Son, and stocked not only stationery and books, but also cycles, ironmongery, haberdashery, fancy goods, childrens' toys and fireworks. After the Second World War the shop closed and Richard Green Ltd. acquired the premises in order to extend their hardware business. Before Thomas Maides Senior died, Maides' Stores published a varied range of black and white (more rarely hand coloured or sepia toned) collotype views of Midhurst, which were printed in Germany. The earliest postmarks date from 1904. Some cards are labelled on the back "Photographed and published by Maides' Stores", West Street, Midhurst", which implies that someone in the family took the pictures, perhaps Thomas Maides Junior, though his father cannot be ruled out. Some other cards declare that they are "The Maides' Series". Yet others are labelled "Maides' Stores, Midhurst", for example a collotype numbered 111505 with a handwritten caption that records the Royal visit to Midhurst on June 13, 1906. 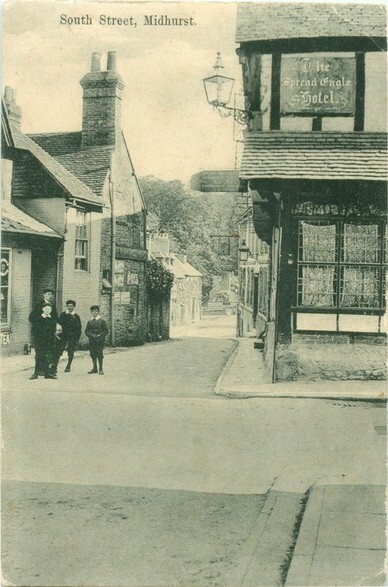 By 1906 Arthur Homewood was supplying Maides' Stores with real photographic cards of Midhurst that had their name on the back. Whether it was he or someone in the Maides family that took the photographs is not known. The Stores also sold collotypes of Midhurst produced by Frith's of Reigate, with their name and address stamped on the back in purplish black ink. Other collotypes that have serial numbers prefaced by the letter W were printed for Maide's Stores anonymously by Wyndham & Co. of Acton. A 1909 postmark has been noted. Wyndham & Co. are said to have manufactured over 10,000 different cards from 1902 onwards. A black and white collotype card of West Dean Church has come to notice, which has a 1918 postmark and is labelled on the back "Maide's Stores, Midhurst. V. & S. Ltd." West Dean is quite a long way from Midhurst and possibly Maide's Stores were responding to a special order, perhaps from the vicar. With the onset of war, it would have been logical for the Stores to cut their links with Germany and ask Valentines of Dundee (V. & S. Ltd) to take over the production of their cards.